The semi-finalists have been determines tonight, with PEC Zwolle, NEC Nijmegen and Ajax joining defending champions AZ Alkmaar in the final four. PEC Zwolle hit Topklasse side JVC Cuijk with a 5-1 scoreline that could have been a lot more if Ron Jans’ side had finished their chances. Dominating from the kick off, Zwolle were ahead inside three minutes. Two defenders got on the scoresheet for the Eredivisie side. 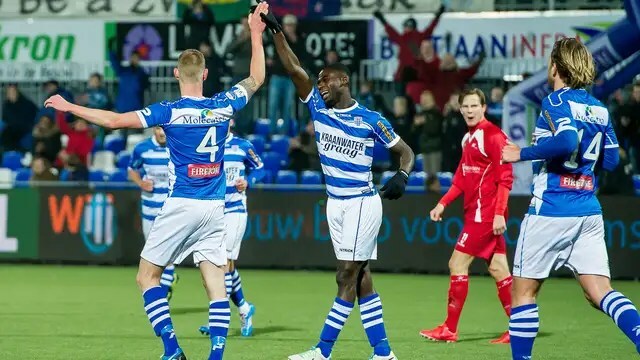 Left-back Bart van Hintum curled home in a free kick from the edge of the area and central defender Maikel van der Werff doubled the lead in the 16th minute. Joris van Gerwen made it three on 19 minutes and Zwolle took their foot off the gas for the remainder of the first half. On the hour mark, Macedonian striker Denis Mahmudov got the fourth and fifth goals with Kevin van Veen’s consulation goal sandwiched in between. Struggling in the Eredivisie, NEC Nijmegen are into the final four of the Dutch cup with a close 1-0 win at home to FC Utrecht. The only goal of the game came after just seven minutes when Marnick Vermijl (on loan from Manchester United) met a Søren Rieks ball from the right wing and the Belgian slid the ball home. Ajax are favourites to lift their 19th KNVB Beker after disposing of Feyenoord 3-1 at the Amsterdam Arena this evening. The visitors took the lead after just six minutes, winger Jean-Paul Boëtius the goalscorer. After Lex Immers played Tonny Vilhena through on goal, recalled Ajax goalkeeper Kenneth Vermeer rushed out and totally mistimed his challenge on Vilhena. The young Feyenoord playmaker attempted to chip the ‘keeper but the ball did not have enough pace to creep over the line, so Boëtius arrived to poke home. Young Danish forward Viktor Fischer notched the equaliser on 34 minutes after a beautiful defence splitting ball from Daley Blind. The ball through played Fischer onside and one-on-one with Erwin Mulder, the Dane chipped the goalkeeper which allowed Daryl Janmaat to get back to challenge. Fischer persisted and eventually placed the ball home before Mulder got back on his line. Bojan Krcic nodded home a second for Ajax on 68 minutes after Mulder had parried a Lasse Schöne header from Blind’s cross from the left. South African midfielder Thulani Serero grabbed a third in injury time to cement the win for the Amsterdammers.